Charlotte Brontë’s Jane Eyre is the eponymous and block-busting mid-19th century romantic novel. First published in three volumes, its narrator, ‘plain Jane’ describes her childhood in the home of an abusive aunt, her punitive schooling, and her employment as governess to the ward of Mr Rochester at the gloomy Thornfield Hall. Rochester, of course, has a dark secret locked up in his attic. 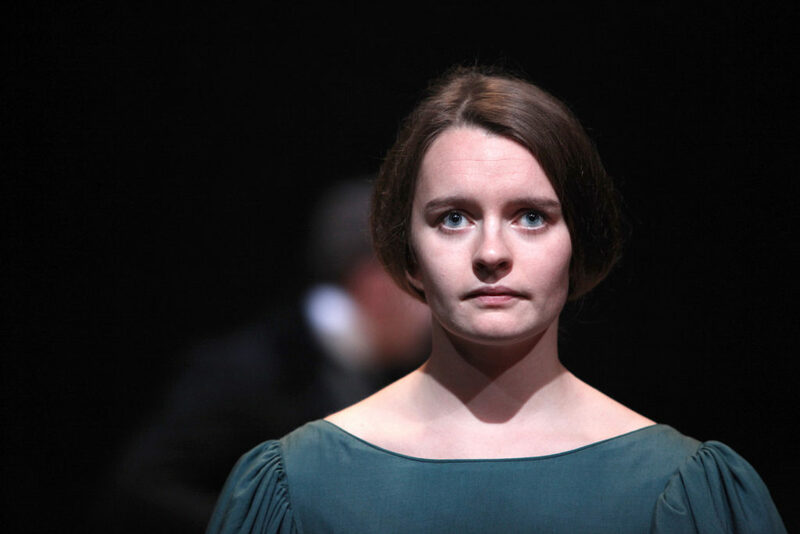 Jane Eyre is a story about confinement, mastery and love. For Rochester, Jane is ‘unfemale’, ‘a wild, frantic bird’ to be caged. But she is ‘no bird; and no net ensnares me; I am a free human being, with an independent will’. This is both a story of 1847 and one of today. Newbury’s Watermill has translated the classic and pioneering novel into a seventy minute show that runs without interval, and that is followed, from Tuesday to Friday, by an interesting question and answer session. Adaptor Danielle Pearson explained how almost half of her text was cut away about a week before the show opened, enabling her to create a taut and vibrant adaptation that remains truthful to the novel. Director Chloe France stripped away set too, and the show takes place with the back wall of the theatre visible and just a few simple wooden boxes on stage. Costumes are traditional and appropriate. Just three actors were cast. Rebecca Tebbett has a luminous quality as Jane, and thoroughly inhabits the Yorkshire in which the action takes place. Wreh-Asha Walton has by far the most difficult task, taking on seven roles (plus Rochester’s dog). Interestingly, she portrays Rochester’s wife Bertha as a Caribbean woman, using some folk-dance inspired moves in a performance imbued with impressive power and authority. 2018 Stage Debut Award winner Alex Wilson has just the right amount of arrogant authority as Rochester. In one demanding and fast-moving scene he switches repeatedly from the role of Rochester to St John Rivers, Jane’s cousin, highlighting the dilemma that faces Jane as she chooses between going to India and returning to Rochester. By stripping away so much that would be superfluous, this clever stage adaptation focuses on the power and poetry of Charlotte Brontë’s words, with some engaging performances from an impressive young cast. Not a moment is wasted. You will have to be quick to catch this satisfying and thought-provoking show which closes on November 2.